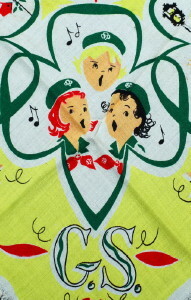 1950's vintage GIRL SCOUTS motif scarf. Yellow and white with red and green rayon. Square shape. Fray fringe edges. All original 50's vintage. Pinwheel shape image with Girl Scout activities: dancing, gardening, singing, pet care, hiking, etc etc etc. Those gals never sit still!!! Good condition, as found. Shows general soil marks throughout and a few small frays. Cleaned and ready to wear. Price reflects condition.